Abraham and crew continue their trek to D.C.
Eugene reveals to Tara that he caused the bus crash. The group finds a safe place to hide for the night, and Abraham sleeps with Rosita. Abraham wants to push on, even with the stops that keep coming and the massive group of walkers ahead of them. 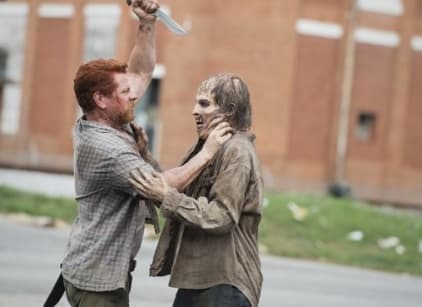 Eugene reveals he’s not a scientist, and Abraham punches him out. Flashbacks reveal Abraham’s family killed and Eugene showing up to give him purpose by helping him complete a special mission. Every direction is a question! Permalink: Every direction is a question! I'm not rubbing dirt on anything. Permalink: I'm not rubbing dirt on anything.